Everyone is painting the inside of glass bottles. DIY tutorials abound! This is my little version. 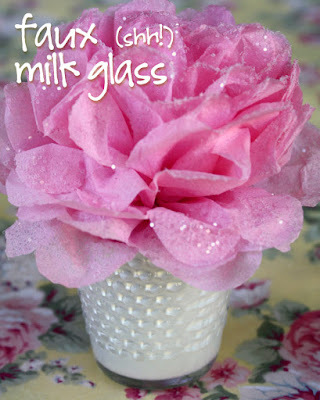 I love hobnail milk glass. It's loverly. It's delicate. It reminds me of Grandma. It's perfect for bridal parties, high tea and all things girly and frou frou-y. It's also pricey. Unless you fake it. Wash the inside of votive and make sure there's no wax inside (especially along the sides). I suggest wiping it down with rubbing alcohol or nail polish remover. Let dry. Use a paint brush to paint the inside of the glass. Air dry completely before applying a second coat. You can also pour the paint into the glass and swirl it around to cover the inside, but I found that method wasted too much paint. After a couple coats, you should be done. Voila! Now, drop a silk flower in your new (faux) milk glass and show off your heirloom treasure!